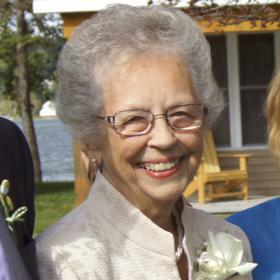 Mrs. Angie M. Schuitema, age 87, passed away Thursday, December 6, 2018. She was born in Muskegon Heights, Michigan on March 15, 1931 to Frank & Bertha (Veldman) Spoelhof and married Jack Schuitema in May of 1954. Mrs. Schuitema had been employed as a Secretary for over 30 years at Coles Bakery, Sealed Power & Westwood Reformed Church. Angie was a former charter member of Westwood Reformed Church and current member of Anchor Point Bible Church. Mrs. Schuitema had been a member of the Greater Muskegon Woman's Club & had volunteered at Hackley Hospital, Frauenthal Center, Harbor Hospice Poppen House and the Supper House of Muskegon. Daughter, Janice Schuitema (Jerome Umanos) of Grand Rapids; sons, Jeffrey (Stacey) Schuitema of Hampton, GA, Brian Schuitema of Roosevelt Park; 5 grandchildren; 1 great grand child; sister, Gertrude (Raymond) Roelofs of CA. She was preceded in death by her husband, Jack in 2003; brothers, John & Gerard Spoelhof. Wednesday, December 12, 2018, 11:00 AM with visitation a half hour prior to the service at Anchor Point Bible Church (Former name, Berean Church) with Dr. Robert N. Renberg Jr. officiating. Internment in Sunrise Memorial Gardens. Tuesday, December 11, 2018 from 4:00 PM to 6:00 PM at Clock Funeral Home - Muskegon. MEMORIAL: Anchor Point Bible Church Memorial Fund.